City Wide Sundecks not only rebuilt our back deck, stairs and railings but also structurally updated and put new casings on a couple of posts on our front porch. Paul understands design, building materials (wood and synthetics) and proper craftsmanship. His goal is customer satisfaction. 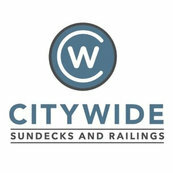 Based on this I would recommend Paul and his crew at City Wide Sundecks. The only reliable and truth worthy company in the city. No nonsense and fair prices. I’m contractor who used them for multiple projects. Highly recommend. I had the opportunity to meet with Heather after reading her online comments. The situation was discussed and process explained better. Bret, It was a pleasure to work with you. Thanks for the great review and the referral! Donna, Thanks so much for your great review. We are so glad to have got you a great new deck in time for summer. Enjoy! Teresa, Thank you for your review and your business. We are very pleased that you are happy with your new deck. Enjoy your summer!